With my recent move across continents, my life has become a bit, shall we say, ‘sedentary’. Okay, very sedentary. In Delhi, I used to get at least 15,000 steps in on a daily basis, I was at work for at least 8.5 hours a day, and ate properly. It wasn’t a glamorous lifestyle, but it was certainly a healthy one. These days, one day feels like any other, and if I were to be brutally honest with myself, my productivity has taken a bit of hit. This is a consequence of ennui (for the most part), but I’m being a little disingenuous. I ought to be able to get my act together on my own, but with even the local ‘mistri’ being outsourced to the internet, I wound up basically procrastinating, and justifying my lack of progress to the lack of any overarching dashboard for my life. Little did I know, of course, that someone has been busy making exactly that. Gyroscope sounds like a dream — a service that plugs in to your offline and online life, and summarises it for you. It accepts inputs from HealthKit, to better monitor your vitals with. It also plugs in to services like RescueTime to show how productive you were online, with Moves to show you where you were over the past day, with Instagram to add moments and photos to your day, as well as some sleep trackers. It brings all these inputs together to form a picture of your day. And oh what a picture it is! So far, I’ve only described Gyroscope, the service. 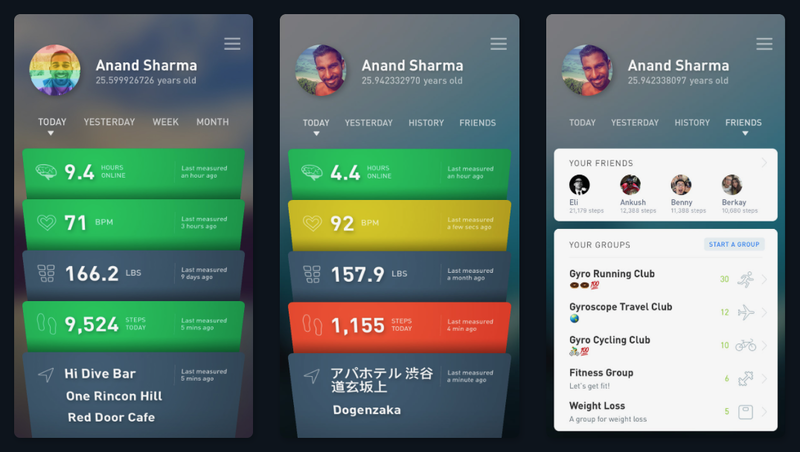 Gyroscope, the app is a prime example of what sets iOS design apart from the rest. While the website is absolutely fantastic in its own right, the developers have really hit the ball out of the park with their iPhone app. It is, to put it simply, a **masterpiece**. Your day is visible to you as a series of cards, and you can dive deep into each card to see the data collected from each service that contributes to it. For instance, looking into your Locations card shows you the places you’ve been to in the day (provided, of course, that you’ve enabled the Moves app integration, for example). The app uses some of the most amazing maps design we’ve seen. The ‘Online Productivity’ card shows you what RescueTime has picked up from your browsing patterns. All these cards can be easily shared as images to any of your favorite social media websites. Another aspect of Gyroscope that makes it an easy sell, is the competitive nature of it. The app offers up a leaderboard, which allows you to see how your friends are doing. All their shared information is put up in the form of a graph, letting you see just how well (or, in my case, how poorly) you’re doing in comparison. This gamification of fitness makes a lot of sense, as Fitbit and other companies have already discovered. Gratifyingly, Gyroscope doesn’t compare Online Productivity. As objective as it may be, because one person’s timepass might be another person’s job, I doubt I’d win the trophy any time soon. Damn you, StumbleUpon! 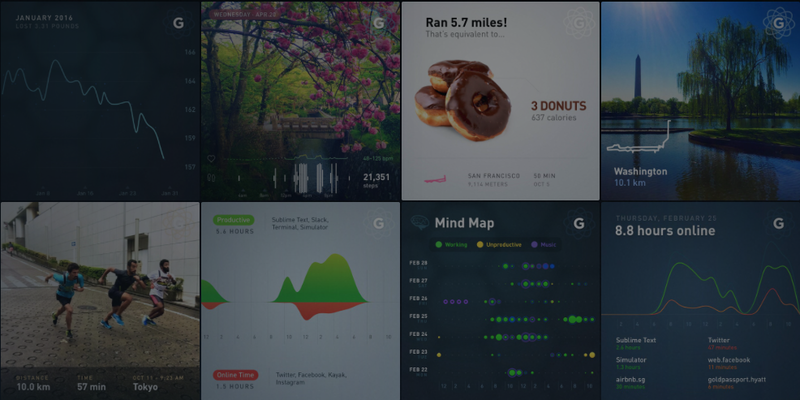 In its free tier, Gyroscope affords you insights into the last couple of weeks of your life. When you upgrade to Pro, you can access all your information, stretching back to the day you signed up for Gyroscope. The thought behind this is that, with the Pro subscription, you can actually use the service as a lifestyle diary, gaining insights into your health and productivty, and the habits or work you were doing that led to them. A few other features that come with a Pro subscription include a custom domain, more detailed information, complete integration with HealthKit (including Food and Water tracking), Sleep Analytics, Detailed Annual and Monthly Reports, and even Genetic Tracking through a 23&me integration. It’s a really nice idea, and one I’d heartily recommend to anyone serious about either turning their lifestyle around, or trying to maintain it. Data is what you need to do so, and when data is packaged as beautifully as it is in Gyroscope, there’s no better motivation. 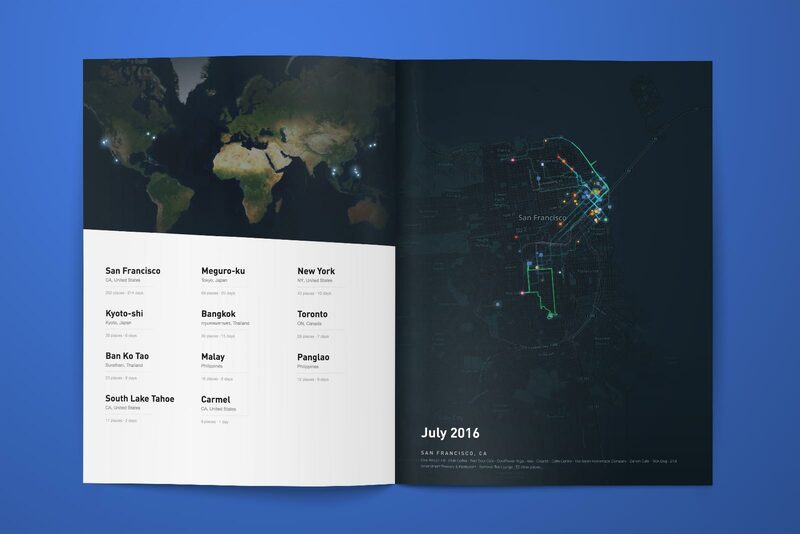 This year, Gyroscope offered a limited run of a printable book of your 2016 annual report. You can order a beautiful printed book with a glimpse of all the activities tracked by the service in 2016. Each book has 64 pages and will be shipped in March. You can preview and pre-order it here. I’d heartily recommend Gyroscope to everyone, but especially to those who’d like to track what they do over the course of their lives. I think it’s a brilliant idea whose time has come. We’re at a point in time where we have the ability to condense our lives into an easy to understand dashboard, allowing us to make changes where necessary. Just imagine that – something as complex as a human life can now be viewed and analysed. We’re at the dawn of a new age, and I for one, am glad to be here. Gyroscope, with its breathtaking design and solid integrations, is an absolute delight. If I had one gripe, it would be the lack of an iPad app. If their website design is anything to go by, the app would look fantastic on a bigger screen. Gyroscope is available for Free from the App Store. 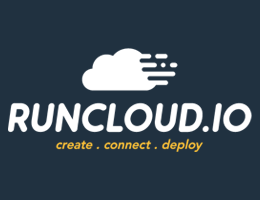 The Pro subscription can be unlocked for $6.99/month or $69.99/year.